A roof rake has a similar design to a garden hoe. It consists of a blade attached to the end of a long pole with the purpose of allowing its user to easily remove snow and other debris from a roof from the ground without having to climb up onto the roof (Source). This can help prevent ice dams and protects the structural integrity of the roof.The way that roof rakes for snow removal work is their long poles allow you to reach all the way up onto the roof from the ground (Source). The blade on the end of the pole is used to pull the snow off of the roof causing it to fall to the ground. Buyers of snow roof rakes tend to agree that this is a product that you want to purchase before you actually need it. Having it ready for that first big snow of the year will allow it to be much more useful than if you wait and get it after snow is already dangerously building up on your roof (Source). It was also suggested by buyers to use roof rakes for snow removal on fresh and soft snow for best results. A few buyers suggested using rust-proof hardware to help the snow roof rake last as long as possible. All of the roof rakes on the list, other than the Garant snow roof rake, are a generous 21 feet long. The Garant snow roof is a bit shorter at only 16 feet long. It’s still a great choice for those with a shorter roof, though. Preform any assembly required as instructed by your roof rake’s manufacturer. Adjust your roof rake to the length required to adequately reach your roof. Lift the roof rake up onto your roof as far as you can comfortably get it to go and lightly ease it down onto the roof. Avoid hitting the roof hard as it can cause damage to your roof. Pull the snow or other debris off of the roof. Repeat until you’ve removed your desired amount of snow or debris from the roof. Be careful to not pull the snow or other debris onto yourself. Avoid hitting objects or shrubbery with large chunks of snow to prevent damage. Don’t try to use the roof rake by actually going onto your roof. Ice and snow can make a roof especially dangerous. Snow roof rakes are designed to be used from the ground. The Garelick roof rake is a good option if you are looking for an ideal tool for fending off snow from accumulating over your rooftop. Users like the handiness of this roof rake, but do complain about the quality of the wheels. This product features a durable aluminum construction and a large shovel head with shingle shaver rollers. Its design prevents the blade head from coming in contact with the roof’s surface and thus prevents damage. The tool is very light and easy to operate yet strong. This roof rake seems like a good choice if you want to brush away snow and relieve your roof top of that additional burden. The general user consensus concerning the Garelick 21-Foot Aluminum Roof Rake is that it does a good job of avoiding pulling down any roof tiles. They praise its lightness, easiness of use, very long reach and strong construction. However, buyers complain about the quality and the poor design of the wheels. Many of them share that they came off within the first hour of use. Some users complain about the tool being somewhat flimsy. The Snow Joe Telescoping Snow Shovel is a solid option for homeowners who want to prevent the damage of ice dams. 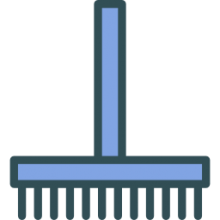 Users love the usefulness of the roof rake, but do complain about some annoying design flaws. This product is ideal for removing snow, wet leaves, and debris from roofs without climbing. It features a twist-n-lock telescoping pole which quickly and easily adjusts from 6.2 ft. to 21 ft. for extended reach. The tool is ultra-lightweight, handy, easy-to-use and durable. 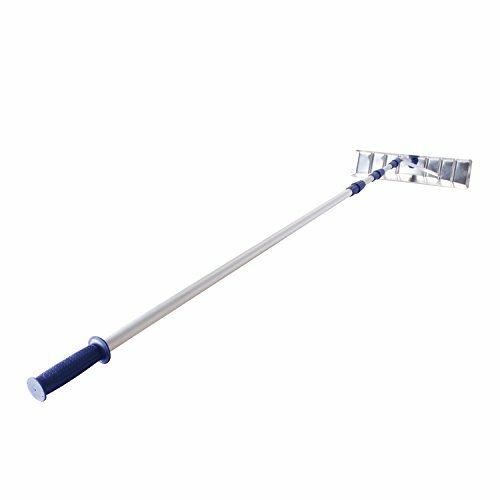 This roof rake could be a good choice if you want to remove snow, relieve unnecessary weight on your roof and prevent damage on the eaves. In general, users have a favorable opinion of the Snow Joe Twist-n-Lock Telescoping Snow Shovel. They agree that it is totally adjustable, lightweight and easy to maneuver.Satisfied buyers recommend it for light snow removal. However, buyers complain about the telescoping handle which does not stay in place but has a tendency to extend or retract. They find this design flaw annoying. Some purchasers complain about the rake part which is really small. If you are looking for a top-rated roof rake, you might want to consider this one offered by Garant. Users love the effectiveness of this roof rake, but some do complain about it not being heavy duty. This product features a 24-inch blade, 3 sections of 5-feet ultra-light aluminum handles, wide-angled head for easy snow removal and an anti-slip aluminum handle. The tool has a resistant polyethylene blade which won’t damage your rooftop. This roof rake might be a good choice if you want to prevent damage due to the heavy snow loads piled onto your roof and save on costly repairs. In general, users have a favorable opinion of the Garant Snow Roof Rake and they agree that it has a nice length and can extend easily to hit the whole roof. They find it to be easy to put together and not flimsy. However, some purchasers complain about the lack of sturdiness. As they explain, the plastic shovel blade leaves little weight to the rake and makes it difficult to cut down through the snow. 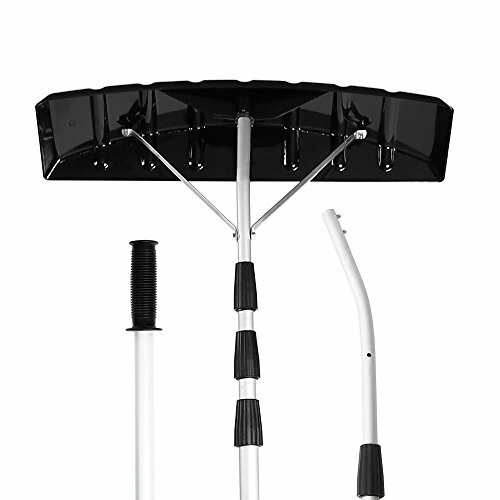 The Ohuhu Snow Shovel Roof Rake is a solid option if you are looking for a tool that lets you remove snow, wet leaves and other debris from your roof while standing safely on solid ground. Users like the usefulness of this snow pusher, but do complain about the poor quality of the construction. This product features a twist-n-lock telescoping pole which quickly adjusts to your desired height (maximum 21′). Its blade head measures 6-inch wide by 25-inch long for maximum clearing power. This item could be a solid choice if you are looking for a tool that will help you with the winter cleanup and defend your roof when winter strikes. In general, buyers are pleased with the Ohuhu Telescoping Snow Blower. They appreciate the large wheels, adjustable handle and lightness of the rake. However, some buyers complain about the poor quality plastic construction due to which many experienced the rake breaking after the first use with harder snow. Some also complain about the pole not locking in place. If you are looking for a roof rake, you might want to consider the Snow Joe 21 feet telescoping model. Users like its handiness, but do complain about the poorly designed telescoping handle. 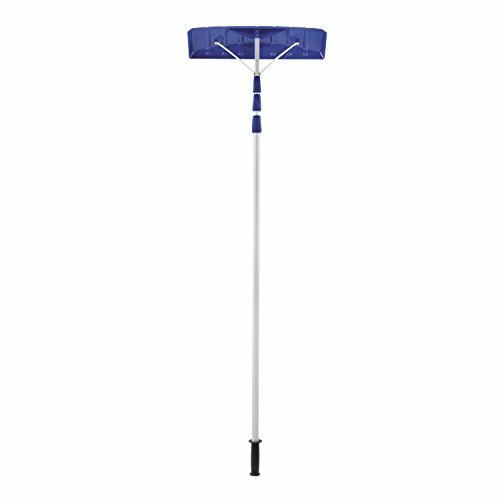 This product is a handy, easy-to-use and affordable roof rake. The twist-n-lock telescoping pole quickly adjusts from 6.2 to 21 ft. for extended reach. Its over-sized aluminum blade rake head measures 6″ x 25″ for maximum clearing and the ultra-lightweight construction allows for easy handling. If you are looking for a tool which effectively prevents damage due to the heavy snow loads piled onto your roof, this might be a solid option. In general, users are happy with the Snow Joe Twist-n-Lock Snow Rake. They like that it is lightweight, easy to expand and well-reinforced. Users conclude that the tool works great, as long as you get the snow off before it hardens. However, some buyers complain about the poorly designed telescoping handle which is difficult to use. Roof rakes are commonly referred to as snow roof rakes. They are essentially long aluminum hoe tools that homeowners can employ to remove heavy snow from the roofs. This is crucial to decreasing structural risk to your home as well as eliminating the potential for ice dam formation. These tools can be a little bit tricky so there are some safety precautions you should keep in mind before you go raking your roof. The first thing you should do is inspect your roof to ensure there is not any loose shingle work or flashing that can potentially snag on your rake and rip a hole in your roof. In addition, make sure that you were gutter is securely attached. It would be ridiculous to end up tearing the gutter off your home while raking your roof. Another consideration is to watch out for falling icicles. While raking it's not uncommon to jolt loose large icicles from the eaves of your home. Wintertime accidents like these can seriously maim or even kill homeowners who are struck by falling roof ice. A third consideration is that if you scrape off a ton of heavy snow it can damage plants and shrubs that it falls on to. You can minimize the risk to delicate garden plants by scraping off small amounts at a time or even shielding your plants with plywood and a tarp. A fourth consideration, if you have a very steep roof pitch, the snow will literally shoot right off it and onto you. Be careful when first raking, then, to get a feel of how fast the snow collapses off the roof to make sure you aren't deluged by an avalanche. While it might be fun for a YouTube video, it can certainly turn hazardous or even lethal, especially for senior citizens, who can become trapped by an unexpected outpouring of heavy snow pack. A final consideration is that when you use aluminum roof rakes they should never come in contact with overhead power lines. If your home gets power from a roof-mounted mast, you don't want your rake to get anywhere near it. 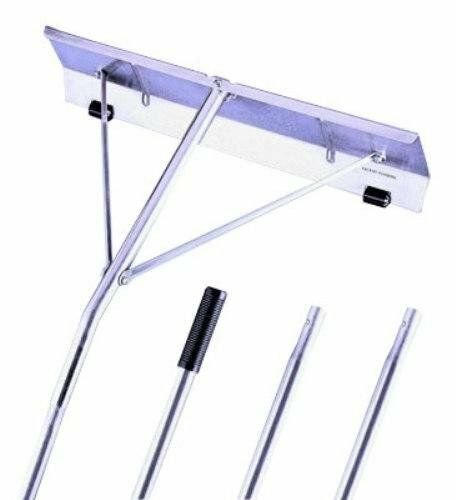 Taking a look at our favorite option, the Garant snow rake, it's marketed as a simple way to remove snow from skylights, roofs and awnings with a durable polyethylene blade and a light weight, anti-slip aluminum handle. Buyers say that while it doesn't push snow, it is great for pulling snow off of roofs. One buyer employed it after a 2-foot snowfall that had left 9 inches of snow condensed on his roof. In addition, he described to us that his gutters were about 11 feet off of the ground with a 45° pitch. The way he was able to use it, he chipped away at the ice crust to break up the snowpack and then was able to drag the snow off sections at a time. Make sure that you do some initial measurements. In our analysis, there are different lengths for handles. For example a 16-foot handle and a 24-foot handle length. Getting a longer option might be the best solution for heightened roof access.